She is talking about her new horse "Rosco" after a Animal Communicating session with yours truly. "This technique you taught me is working pretty well! Did that with Rosco, awesome first time out way past horses used too, and went past the cows. Slowly on the way out had him in his gait going fast on the way back. I could feel his trust in me, especially with the cows, and new things. He doesn't throw hissy fits when asked to do something new. Basically trust and performance is with his whole heart. Here is Leo. Look how he's grown! I almost killed him 2 weeks ago, when I put him in the garage to hunt for mice. I had forgotten about the decon I had placed there after $6000 mice damage to my car.. he started having severe neurologic symptoms, vomiting, and unable to eat or drink. The vet kept him overnight in the hospital and allowed me to take him hone the next day, expecting him to die..he was so very sick, then I remembered CJ Gilbert, who heals animals.. she had healed my daughter's dog who was dying. Within hours of talking to CJ, little Leo, was able to stand up and trying to walk again. Within a day he was drinking and within days he was able to walk without falling vet. Today he's completely normal. I wanted to stop in and give a testimonial. I had my first clinic in about 25 years last weekend, and the first one with my current love - his first trip off the farm since he came to me 6 years ago as a youngster. I messaged CJ in a panic of stress and worry. Within half an hour of standing with Darby and reconnecting, practicing some simple visualizations, we were both calm and raring to go. I was no longer shaking on the verge of tears, my horse and his mini buddy were calm and connected with me, and we ended up having a hugely successful, calm, memorable clinic! I have some new cherished memories thanks to what CJ taught me was so easy to do! I would like very much to say a few words on the wonderfully enlightening experience I had with C.J. Gilbert and her gift with animal communicating. I have labored over past 4 years with my "quirky" 20 something quarter horse mare. She hated to be touched, and seemed "angry" with me constantly. I got more insight into my mare in the hour that C.J. worked with her than in the past several years of professional horse trainers... and my labor of love. To KNOW the root of the problem( past abuse, and abandonment issues, lack of trust etc.) and to actually SEE my mares attitude change.. well it was truly worth it!! !My mare picked her oils and to see her relax in the hands of this gifted loving woman, well it just boggled my mind. I feel so empowered and hopeful. She has allowed me to delve even deeper into my loving companions heart and soul. S.W. ITS A fact, that goiter is gone, healed! There is nothing there!! He feels so much more balanced. I got a new saddle pad and he def likes it very much. I don't know what to say except Thank you so much. My faith has always been in you!!!. You and Beauzy rock!!! Noticed a very calm and gentle, giving his all, horse. It was a very long day yesterday, long ride..4 hours. He looks awesome. People ask me how old is he? .they are.amazed when I tell them, a very young 20. A client's horse was picking up a bad habit from another horse in the same pasture, not wanting to be caught. After we did some clearing work. I gave her a process to use. She now has no problem catching him and the other horse ( belongs to someone else) who didn't like to be caught comes up to her. The cool thing is this was all done over the phone. And the process I gave her is done verbally or in your mind when your not around your horse. I just LOVE my job. I had the honor and I do mean honor to work with a horse (reconnective healing session),and then later with the owner. The owner has had concerns with her hips being twisted. It made it hard for her to sit straight and be relaxed in the saddle. This came about from a car accident from some 40 years ago! She well knows how her body position effects her horses when she rides. She would regularly have them both adjusted as well as her self. Today I asked her if she would like me to clear this? She said Yes! So I waved my magic wand and then asked her to get up and move around. She said her hips were loosening up. Cool! Then I asked her to look in the mirror. She said her hips look even now. She also felt warmth in different areas of her body. How exciting an injury from some 40 years, has been released from her body!! It was so sweet both her horses came in and said they were happy for her. ( I'm animal communicator too ). Update. . Heard back from client she had an amazing ride. In her words she felt like they were one. Big change from her last ride. How can it get any better? Received a complement from a stallion owner. The mare she bought well--- the stallion rejected her. I did some of my magic work with the mare. She reported back to me that the stallion accepted her and she is in foal! I just want to tell you about my horse Tori, she is a Morgan and has lots of energy. I ride trails with my friend Dodie, and Tori can be spooky and can jump, Dodie became an excellent rider by riding with me, as she learned to stay on her horse when mine spooked. Well Tori got worse she started refusing to go down trails she would actually hyper ventilate, I had a strong urge to get off and put a paper bag over her nose. Another thing she would do is She would move all over the place trying to put a saddle on her, so that was never a bunch of fun. So I called a Lady named CJ who came out and changed the energy around Tori and myself both of us had collapsed energy Cj told me I had to leave my problems at the gate as Tori would be stressed out about all my problems I was dumping on her. I was suppose to come and ride and be relaxed not full of problems and worry. CJ brought our energy levels back and our awareness. Tori has greatly improved, I have had great Trail rides with her and she goes to the spooky end of the riding arena, not hyperventilating in fact my first time I took her out on a trail ride with Dodie and 2 other friends we stayed out way to late and we were riding in the moon lit night Tori did so excellent I thought I was on the wrong horse, she was calm and I asked her to keep me safe as I could not see where I was going and I would give her and extra helping of hay. Best ride ever. I know we need to work on some things but she saddles easier stands better and trails better and I owe this to CJ working her wonderful energy gifts upon us. My friend Dodie can not get over the change that has taken place with Tori and Tori is no spring chicken she is 24 Looking forward to many more years of trail riding. Now if I could slow her pace down just a bit as she walks so fast that we are way ahead of everyone else, so lots of circling So please with what CJ was able to accomplish with Tori and I she is crossing water with little to no fuss as well. If you are having problems with your horse call CJ. If you are having issues with your horse or if you are having problems with your life, you need CJ in your life, she has helped me my horse Tori and my family and they did not even know it...Priceless Beth E.
Actually cj i felt, he was walking easier, generally he seemed in a much better mood! He and Angel, my kitty, seemed friendlier to each other. I believe they pretty much just tolerate each other. Jeree is very jealous of Angel, I know that. Its funny, i can always tell when you are working with him. When u tell me when you are going to be working with him i always keep my eye on what he does. He always curls up just a little while lying quietly with his eyes closed. I know hes not sleeping, its just like he doesn't care whats going on in the room at all. One thing in particular i noticed. He quit chewing on his elk antler incessantly! Hes just started back a little now, but not like he always chews. I also noticed his back is straighter. And just an update on Beau. He is just fantastic! His goiter is stillll gone!!! Energy level sky high, i connect with him so easy. I wanted to thank you again for the amazing work you did with Bella. Since the distant session she no longer hisses at my Son, no more growling and running out of the room when he comes in. He can even pet her! This has made life in our home so much better and there is less tension. Anthony would get really sad because he had no idea why Bella seemed to hate him so much. Even though he is 20 years old I could see how it was upsetting him so much. When I shared with him what you told me as to why she was behaving that way, he understood that it wasn't personal or anything he had "done" to have her act that way towards him. That information alone was priceless, but now that he can even pet her!!!!! Talk about icing on the cake! My whole family is so grateful for your gifts with animals and the services your provide. I started giving her Energy-healing within minutes her leg came down. Next she walked over to her feed bucket. I noticed that she was putting weight on that leg. Then after she was done eating she walked over to the stock tank moving much better. Take Care & Blessings To You ~ I'm sure we'll meet again. 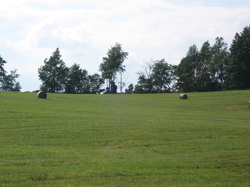 I thought I would try Energy Healing with our Hay field. Results a bumper crop! My first concern was a gelding of mine who was short-stepping again. This had been a reoccurring problem since he had been growing erratically - hind end up high, then front end up high, etc. Although he has just turned 7 this year, I had not even considered cantering him. My vet suggested X-Rays for the entire hind leg, and he wasn't even sure that it was his leg that had the problem - it could have been his back! When I had a phone session with C.J. she was able to communicate to him as well as give me an idea of where the problem lay. She has instructed me how to use a mantra which is extremely simple and easy to remember! His short-stepping disappeared that day. She pointed out that he was a reflection of me, and that I had something 'stuck' in my universe. Upon examination of myself, C.J. was able to help not only my horse, but me too! I have been using it with the rest of my horses and anything around me that I can think of that might be a living thing! As a result, my horses are really happy, and this isn't just from my perspective! My neighbors, with whom I have been helping train their horse, remarked just last night that in the last week, my horses have been playing like crazy in their paddocks while I have been training their horse. The playing has been so demonstrative that it has been difficult for them not to watch my horses playing instead of paying attention to me training theirs! 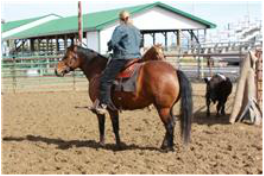 An example is: I have a 17-year-old stallion who runs loose with my two geldings. There is also a long rope swing for our grandchildren to play on (long rope with a board on the end) hanging in the paddock. One gelding grabbed the rope and plopped the board end over the steel gate towards my stallion. The game of tug-of-war went on for about half an hour! Before me using the mantra on all of my animals, my stallion would chase the others if they played. It always looked like he was chastising the others for having a good time! Not now! After the neighbors left and my horses had the complete area to themselves, they put on such a demo that it took my breath away! There were airs-above-the-ground, mid-air bucking, passage and every wonderful dressage move you could imagine that was performed by all three of them! Needless to say, I am truly happy not only with the outcome of the above, but I now have a way of dealing with life from a very different perspective and that makes each day much more fun. calming energy up his leg and into his body he is either yawning, licking and chewing, or his lips are quivering. Thanks so much for that advice. It seems to be working very well. Have a great week-end at the girls' week-end. How was your time in Colorado? Hope it was fun. C.J. 's positive attitude , love for horses, and desire to help others achieve peace and harmony in their lives, and with their horses makes her amazing teacher. Your very good at getting the rider to connect to the horse, instead of the aids. You, my friend, have a wonderful gift and talent. The most recent and most amazing thing I've seen C.J. 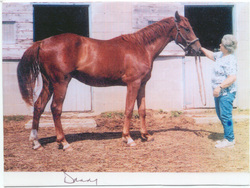 do was with Danny, my three year old gelding who was brought back from the trainer as a reject. We don't know how all his problems developed, but the recommendation was to sell him as bucking stock, because he was really good at it. A chiropractor determined that he had many trouble spots, but the neck vertebrae between the shoulder blades were the worst and also the hardest to fix. When I brought him home, his neck was upside down and looked like he swallowed a football and it was stuck half way down. His chest had no muscling, his sides were sucked in, he was swollen over his croup, his tail had a dip in it, he had muscle spasms in his belly and loin. In short he was a mess. So I called C.J. and she said " no problem". This one I wish I had taken before and after pictures, because the results were so dramatic and obvious. C.J. worked with him and when she was done, he looked like a horse again. After a couple weeks rest, I sent him to a local cowboy who can ride anything. But his rodeo skills weren't needed. Danny didn't buck anymore. He's under saddle and his training is progressing normally. Have you had a trauma keep you from enjoying your riding? A client fell off her horse during a trail ride. In her words she said " My body isn't healing anymore, plus my mare won't load into the trailer now, and I'm seriously thinking of canceling going to a upcoming riding clinic". After 1 Coaching session she decided to go to the clinic. Here's the email she sent me. about how great it had felt when we were cantering, the pain went away (usually instantly). 2) Sugar loaded in the trailer with no problem both going to the clinic and coming home. was at the exit/entrance of the 90 degree turn. When we went to leave she carefully backed through the turn with no prompting. She was proud of her new accomplishment! It brought tears to my eyes. 4) All during the clinic, Sugar managed to perform maneuvers we had never done before. She was hesitant to go into a lope though she always took off on the correct lead. I have decided we develop our slow lope . BTW, At one point Lloyd was working with some dressage riders on their 'extended trot'. Sugar and I were just trotting around and I was posting with ease. Lloyd was impressed by my seat and Sugar's ability to pick up an extended trot. "I have known CJ for over 14 years. CJ came into my life when my life was very depressed. CJ was for me a life coach, teacher, healer and friend. I would not be the person I am today if it were not for CJ pulling me out of the pit I was in and adding real value to my life. I am 64 years old and thanks to C.J. and another wonderful lady, Bev, I am fulfilling a long time dream. I had been away from horses and riding about 20 years, raising family and career, although the love of horses was always there. About a year and a half ago I found out about Bev, an accomplished horsewoman who has 17 horses and was now giving 4-H kids the opportunity to learn to ride and show horses. Well, she also had a group of "senior girls" who just loved to get together and ride for the fun of being around horses. So started the first leg of my journey of learning to ride English and learning Dressage and jumping. You really find out just how de-conditioned you have become. At the Midwest Horse Fair I attended several demonstrations for equine chiropractic and massage. I asked Bev if she knew of anyone who did this that I might talk to. I am a great believer in events taking place at the right time in your life and with the right people. 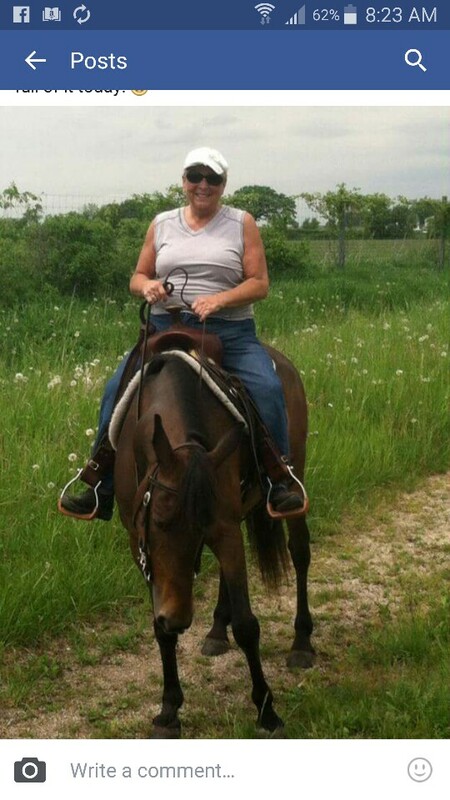 Bev said, our farrier's wife does different types of work with horses she would be a good place to start. This was how C.J. came into my life. In talking to her over the phone I got such a feeling of energy and enthusiasm. A few months went by and I just concentrated on learning to "post and keep my diagonal". Then about 5 months ago Lakota came into my life; a 10-year-old gelding who had been ignored for the last couple years. This is when my journey to achieving my dream really began. I spent 3-4 weeks just grooming him and talking to him. (My family kids me about being the grandma that talks to animals; if only I could hear them answer like C.J. can). Lakota had a scared far-away look in his eyes, didn't like to be rubbed around his face much, would throw his head up and back away, but he tolerated me. Then came the day I started riding him in classes. He had no energy. Oh, he would walk, trot, and canter, but was disinterested and dull. I began doing groundwork with him or trying to; no cooperation, lifeless, dull. This was very slow going. Then the winter set in and even though we had an indoor arena to use most of the time it was just too cold. Lakota began developing bad habits. Suddenly, everytime I tried to brush him or just run my hand over his back he would bite at me and raise his leg to kick. He had to be distracted with a small amount of feed just to saddle him; I would wrestle him 10 -15 minutes to get a bridle on him. When I was in the saddle and during class he was even more lethargic and slow. He would not pick-up the left lead in a canter. C.J. and her work with animals and people keep popping back in my head. One day I went on her web site and signed up for a phone session. I wanted her to ask Lakota if he was hurting anywhere and if that was the reason he didn't want to be brushed or touched; was I doing something to offend him. Lots of questions I could ask him, but didn't have C.J. 's gift of spirit to hear his answers. Thank goodness the 3 of us didn't have to be face-to-face because it was 10 degrees that day. As it turned out he was a little sore in his back, which C.J. corrected. But he was mostly unsure that I was confident enough as a leader and was testing me. C.J. also found that 6 entities were riding along as excess baggage on him and really messing him up. This was why he seemed so disinterested and lazy and slow (guess I would be too under the same circumstances). C.J. banished all of these and gave me a clearing statement to use. She said to see in my mind what I wanted Lakota and I to do, "whatever I could imagine was possible." 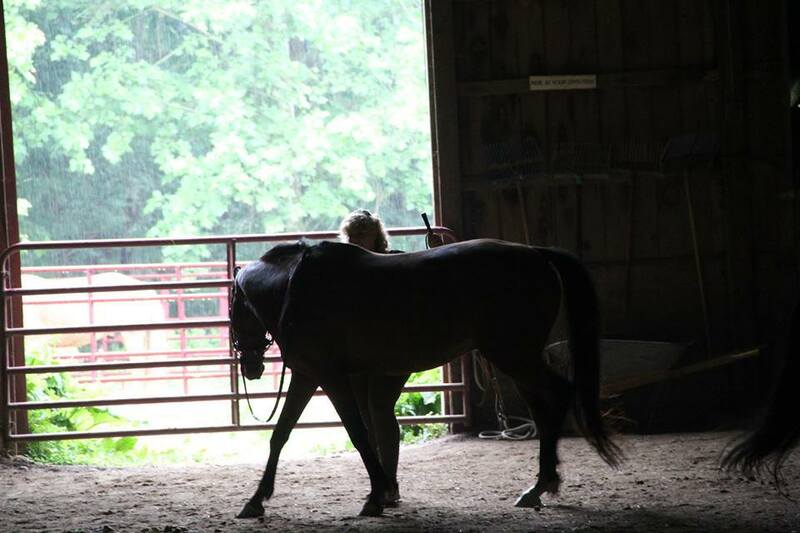 Two days later I went to the barn and brought Lakota to the indoor arena. The first thing he did was gently rub his face against my arm and looked me right in the eye with the softest, most beautiful dark eyes I had ever seen. I was on cloud 9 .... He let me brush him and rub him all over, NO biting or kicking at all. I couldn't wait for class to see how he would be now. I didn't have to distract him to saddle him. He seemed to have more energy and was paying attention to cues. But, the greatest thing, he took the cue for a left-lead canter first time and we went around the arena 3 times without missing a step !!!! He took jumps without coming to a screeching halt right in front of them. We even took higher jumps with ease. My repeating the clearing statement several times helped us stay in-tune to each other. After class Bev said, that was the best ride Lakota and I had had and there was something different about him now. I just smiled and gave him a BIG HUG !! We still have things to work on, but that is the exciting part of our journey together. As C.J. said, "How good can it get?" I know without Bev seeing how much I wanted and needed a horse to work with and without C.J. with her wonderful gift and glowing spirit, I might have given up on Lakota and myself and not been able to take this wonderful journey I've dreamed so long about. The best is yet to come!!!! Just wanted to update you!!!! Thanks. propel my horse forward. You rock! Thank-You so much for the processing today. It was amazing and I'm still allowing the shifts to integrate. You Rock! Just wanted to let you know, I tried "playing with time" on Sunday to make the day stretch out long enough to complete the jewelry I needed to complete and send to a gallery before they lost interest. Anyway, it worked...longest day off I've ever had! Usually the time flies by and I feel like I haven't had time to do anything but clean house and eat! Not only did I get the jewelry sent out this week, but I even completed more pieces than I was planning on creating. Anyway, I did the same thing today, and while I didn't get quite as much done, I did manage to start some sculpture armatures I've been putting off. Also since our work on the dog/cat relations, one of my cats (he's been living at the neighbors for months, if not closer to a year) has been home morning and night for meals and more affectionate and playful than ever before (I also worked on him alittle in person right after the workshop, since he was actually at home). I also tried alittle experiment on one of my other cats (10 yr old) and her eyes immediately changed and she started playing like a kitten...not something I've seen in at least a few years. So anyway, thanks. It's been interesting and I'm going to keep playing with what I've learned from you. I just moved to a new apartment and am quite happy with my decision and the possibilities once all the boxes are history. My roommate is Sammy and I did not consult him about moving since he is a cat. During the move I noticed enough cat hair that I decided to put him in the main bathroom during the day when I am at work to minimize that concern. By Thursday I was struggling with my decision to take him to the farm. I had tried to call my daughter that morning to see if I could bring him at lunch time and they were not home. Then I remembered CJ Gilbert who was in our group initially did work with people and pets. It was enough of an issue that I called her and was telling her how I was feeling torn between having Sammy unhappy in the apartment and taking him to the farm where life would really be different (he would be one of many animals and would not be an inside cat any more). she suggested we might be able to make some changes that would please us both and we could enjoy life again!!!! Our conversation moved me to a higher vibration and alternatives began surfacing from the 2 choices I thought were available. I learned a lot from CJ about relationships with pets and how it affects our experience and ways to improve that experience for both. This is the sales approach.....I decided to put him in a guest bedroom instead of the bathroom during the day. NO RADIO FOR A FEW WEEKS TO GIVE HIM RECOVERY TIME! The next morning I put his pallet on the bed so he was high enough that could see out the window and watch the birds in the tree. I moved cat heaven from the bathroom to the bedroom. I talked to him and told him I wanted him to be happy and I wanted to be happy and we could try this out a while to see if it would work....I told him I go to work each day and he could consider this his job for the day....he was purrrrring before I left the room.....hmmmmmm. .. .... nice sales job! It's been a week now and seems to be working out fine....this morning was my confirmation....before I left, I was looking for Sammy to put him in the bedroom and found him already on his pallet purrrrrrring like a Happy Cat!!!! they don't care how much you know about your needs until they know how much you care about their needs. Update on Kipling: he is doing FANTASTIC! He is cuddly and happy and full of life. He wants to be with me wherever I go. He's an alert guard dog again. Today I had a session with CJ and my horse Rainy, with the intention of improving my riding and improving her frame. Previously, I’ve been working with my hands to get her nose down (from sticking out in the air) while I encourage her forward at the trot. She would have it down there for a few seconds and then bob it out again. Her back was not rounding. It has felt like a subtle battle of trying to convince Rainy to carry me in a more rounded frame while she in turn resists my suggestions. So during our session, to work on my riding, CJ had me bring in the energy of Reiner Klimke. She asked me if I have any videos of Reiner riding, and I said no, I’ve just seen a short one that I check out from the library. The video begins by showing him riding a horse on a loose rein at the walk. This horse is lowering his head and really stretching out and getting swingy at the walk. When I’m thinking of this and starting to explain it to CJ, unexpectedly my horse Rainy begins to lower her head at the walk and really stretch out. She almost had it on the ground! This may not seem remarkable, however I have previously tried many times (with little success) to get Rainy to relax and lower her head at the walk, encouraging her to stretch down. Suddenly she’s doing it on her own, apparently because we were energetically connected and I was visualizing it (and feeling it) with CJ’s coaching. The next amazing thing happened at the trot, when CJ reminded me to bring in Reiner Klimke again while I sustained the energetic connection with my horse. I got the intuition to imagine what it would feel like to be the horse, moving in the way that I wanted her to move. Instantly she’s trotting around the arena in the frame that I’ve been previously struggling to achieve, and all I can do is smile all the way around as I am rendered speechless that it’s happening. I wasn’t using my hands to force it, it was just natural and I could feel her round underneath me. .
Before our individual sessions with our horses, we began with one hour of “classroom time” where CJ shared theory and personal experiences to open up our awareness of what is possible. We did some energy exercises and set an intention for what we wanted to achieve. I love taking notes during this part of her classes because I know I can refer to these tools and use them to enhance other areas of my life. I feel I have a gold mine of valuable tools in my notebook from today. I went home feeling inspired and very happy, and I still feel that way. Thank-you, CJ, for sharing your afternoon with us and for the amazing things that we accomplished together. My German Shepherd puppy Jeree T.
since all his baby teeth had not fallen out yet, and that, that, could be the problem for his teeth coming in, incorrectly. till about seven month, and see how his teeth would come in. This is where C.J. came in. thought of C.J. because we go back a few years when she helped me with my horse Beau. What a good time!!!!!! on him, and that she would start immediately. After doing one treatment, she said she had to go back 5 generations to break the negative energy pattern. area. She emailed me back, and said she would the treatments more often. As it worked out, I had her do treatments equivalent to two month work. to be!!! I was ecstatic! The one hole that remained was healed and not red or raw anymore, and today, his right lowered canine is right where it should be! THESE OILS HELPED HEAL, AND WILL CONTINUE, IF SO CHOOSE TO USE THEM. is a good idea on your part! I just can’t thank you enough. I wonder what Jeree’s vet will think on our next visit, when she checks his mouth! 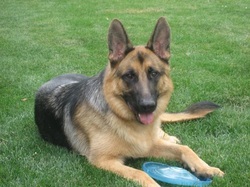 Disclaimer: As a Animal Communicator & Energy Healing Practitioner, I do not diagnose, cure, treat or prevent disease. I am not a medical doctor , Veterinarian or practitioner of any other health specialty regulated or certified by the state. While engaged in Energy Healing & Animal Communicating services I provide, you must not suspend or alter your medical treatments without consulting your Veterinarian or other certified health professional. Your experience will be unique to your animal companion. Yours could be the next success story!